White, healthy-looking teeth are an important part of looking and feeling your best. 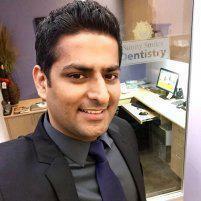 At Sunny Smiles Dentistry, Dr. Sandaldeep Singh offers state-of-the-art teeth whitening solutions so you can enjoy a healthier-looking smile, after a single, one-hour appointment. Plus, he offers at-home whitening options to help keep your teeth look their best between professional treatments. To schedule an appointment, call Dr. Singh’s Gilroy, California office or schedule an appointment right now using his online system. What causes teeth to become stained and discolored? Dark-colored berries: Cranberries, blackberries, etc. Foods high in acids, like citrus fruits, sodas, tomato products, or energy drinks temporarily soften tooth enamel, which makes it easier for stains to penetrate your enamel and leave stains. And of course, poor oral hygiene habits can also make your teeth look dingy and dull. At Sunny Smiles Dentistry, Dr. Singh offers both in-office teeth whitening treatments completed in about an hour and take-home whitening kits that feature a custom design for optimal results. Take-home whitening products take longer to produce results, but they can still give you a great-looking smile. Take-home treatments are good for prolonging the results of an in-office whitening treatment. How are in-office treatments performed? During an in-office whitening treatment, you wear a special guard to keep your lips away from your teeth to help the whitening agent penetrate better without being wiped away by saliva. Dr. Singh applies a gel to your gums to prevent them from being irritated, then applies the professional-strength gel to each tooth. A special light activates the gel so it penetrates deeply below the tooth surface to eliminate stains. Can professional teeth whitening get rid of all types of discoloration? Teeth whitening methods are designed to correct stains and discoloration in the more superficial layers of teeth. Discoloration in the deeper portion of a tooth is caused by issues like decay, trauma, disease, or long-term use of some medications. These deep discolorations need to be corrected with veneers or crowns. Is professional teeth whitening more effective than over-the-counter bleaching kits I can buy at the store? Yes. Our professional teeth whitening treatments use gel formulations that are stronger than those available in over-the-counter products for far more dramatic results in a fraction of the time of store-bought kits. In fact, our whitening gels have concentrations of hydrogen peroxide — the primary whitening agent — that range from 25%-40%. Most over-the-counter products have concentrations of 3.5% or less. In-office treatments also ensure more even distribution of the whitening gel so your results are more consistent.